Some of these publications are issued under a Creative Commons licence, permitting printing and distribution for purposes such as education and advocacy, providing that reuse is under the same CreativeCommons license and carries the same statement as the original document has stating this. In the Antropocene, what role for permaculture? In the Anthropocene, what role for permaculture? We’re speeding along the Great Acceleration, heading into the Anthropocene — the Age of Humanity. What role will permaculture play in this emerging world in which humanity is the major influence on earth systems? Can it find an influential niche from which to project its ideas? Are those ideas still relevant to the type of world that is emerging? Humanity has transformed the earth. The challenge is to learn to do this properly. A collection of ideas for alternative structures in the permaculture design system. In our cities, footpaths are becoming gardens as people colonise them with vegetables, herbs and fruit trees. This ebook takes a look at the benefits of footpath gardening, the challenges it faces and some of the design considerations that are best thought about before you start farming your urban footpath. Australiasian Permaculture Convergence 10 (APC10) in Cairns, 2010, visiting an enthnobotanical collection in Far North Queensland. A report on the 2007 GoLocal conference in Brisbane, Australia’s first conference on localisation. A submission written for the Sydney Food Fairness Alliance for the revision of Brisbane’s city plan. The submission addresses Brisbane City Council’s ideas for the city’s food system. A manual about organisational communications for community based agencies, advocates and small business. The report presents the ideas of speakers at the Environmental Educator’s Forum that was held at the University of Western Sydney in July 1997. Report on the three-day seminar on the application of ideas from the permaculture design system to working with schools. The seminar was held immediately prior to the 1996 Permaculture Convergence and was led by New Zealander, Robina McCurdy, at Black Forest primary, Adelaide, South Australia. 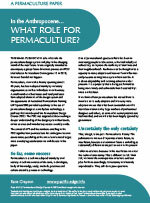 A guide to resources in print compiled by participants to the Permaculture Goes to School seminar. Forms a set with the above publication.